WSBK-Eurospeedway Lausitzring in Germany. | B.I.R.D. Discussion in 'The Sports section' started by KUCIAR666, Aug 15, 2017. After a month’s break, during which riders and mechanics alike had chance to enjoy some holiday time, the Althea BMW Racing team has recharged its batteries and is ready for the tenth round of the 2017 Superbike World Championship, taking place this weekend at the Eurospeedway Lausitzring in Germany. 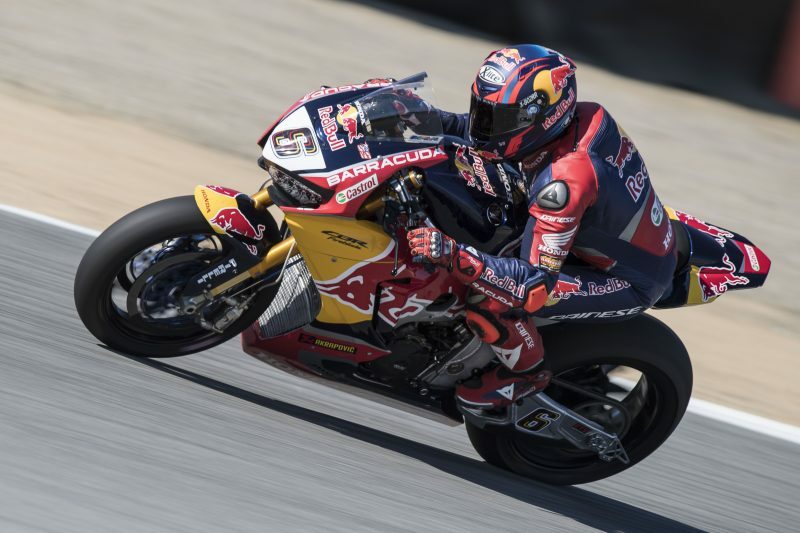 The last Superbike event concluded just over a month ago at Laguna Seca in the USA. Torres closed race one in seventh place, De Rosa thirteenth across the line. After the first nine rounds, Torres lies ninth in the general standings, with 94 points, while De Rosa is 18th with 30 points scored up until now. In the Superstock 1000 series, Faccani is in fifth place with 52 points. At last year’s German round, Jordi just missed out on a podium result, finishing fourth in race 1. In what was a wet Stock1000 race, De Rosa crossed the line tenth at the Lausitzring having started from pole, while Marco Faccani suffered a crash. 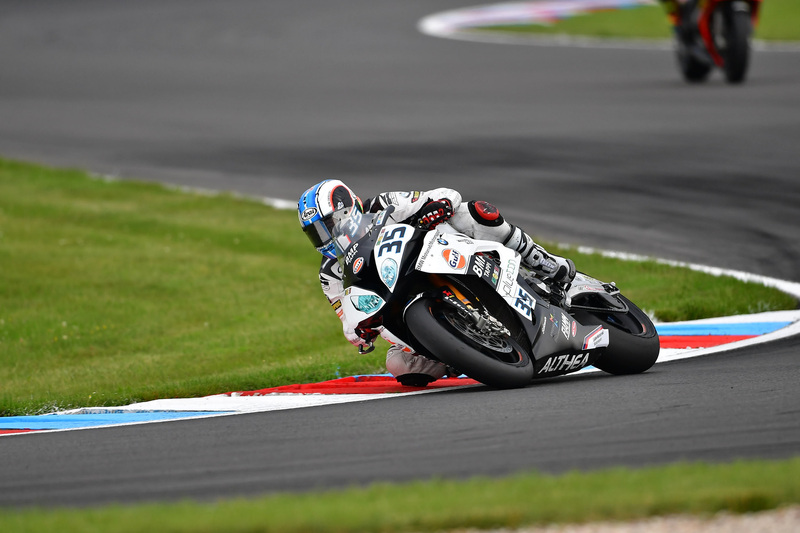 All three of the Althea BMW men hope to make the best possible start after the summer break. SBK RECORDS: Best lap – Davies (Ducati) 1'37.357 (2016). Superpole – Davies (Ducati) 1'37.883 (2016). 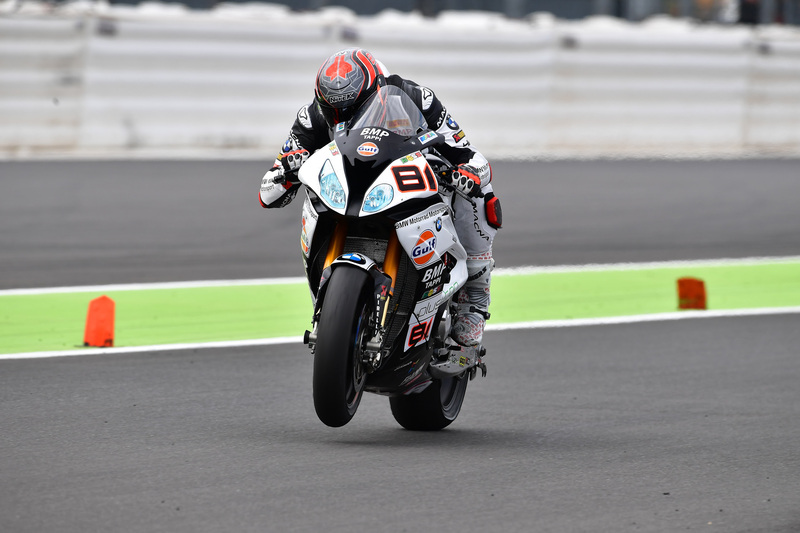 After a summer break of five weekends for the 2017 FIM Superbike World Championship, racing will get underway again over the weekend of 18th to 20th August, at the Lausitzring in Germany. 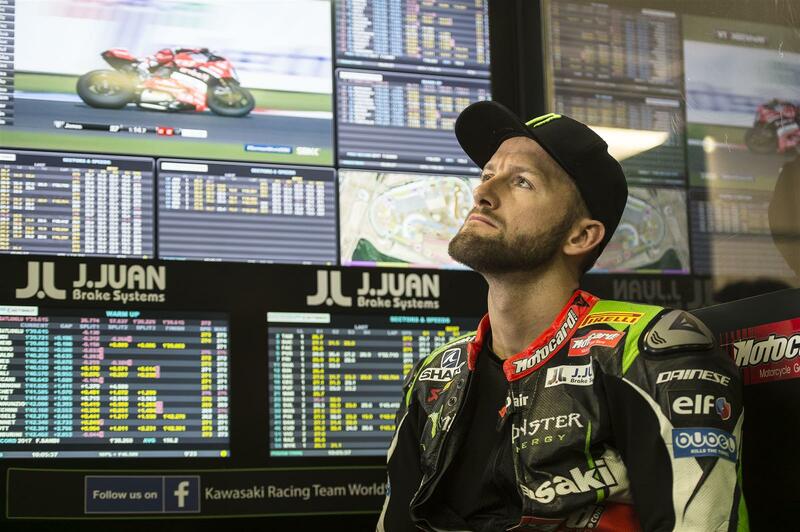 After a successful recent test at the 4.255km-long EuroSpeedway Lausitz both championship leader Jonathan Rea and second place points scorer Tom Sykes are well prepared for their next chance to aim for race wins and podium places. Thanks to a tally of nine race wins through the first sector of the 2017 season double KRT world champion Rea leads his own team-mate Sykes by 59 points, after the eighth meeting of the 13 round/26 race series in America last month. Having taken victories in two races in 2017 Sykes is keen to get back to winning ways again soon to try and close the points gap to the lead. Tom currently has a 56-point advantage over the third placed rider in the championship, Chaz Davies. 2013 season champion Sykes will also celebrate his 32nd birthday in Germany, on Saturday 19th August. The two 21-lap races will be held on the 19th and 20th. The Lausitzring will be hosting its seventh WorldSBK weekend this time around, after returning to the track in the far east of Germany last year for the first time since 2007. Rea notched up a race win at the vast Lausitzring for KRT in 2016, in conditions of heavy rain during race two, recovering strongly after a no-score in race one. After the completion of round nine in Germany the championship returns to a WorldSBK venue from its relatively recent past, Portimao. Round ten in Portugal will take place over the weekend of 15th to 17th September. The Pata Yamaha Official WorldSBK Team are excited to get back into action after the summer break for round 9 of the 2017 FIM Superbike World Championship at the Lausitzring this weekend. Alex Lowes recently extended his contract with the team until 2018 and after completing a hat-trick of wins with his teammate Michael van der Mark with the Yamaha Factory Racing Team at the Suzuka 8 Hours in July, both riders are feeling confident of hitting the ground running following on from a successful recent two-day private test at Almeria. Lowes extended his contract with Yamaha last week, meaning he will line up alongside Van der Mark once more in 2018 to give the team some added consistency as they continue to develop the Yamaha R1 and to close the gap to their rivals. The two Pata Yamaha riders are fresh from their historic victory with the Yamaha Factory Racing Team at the Suzuka 8 Hours where, not only did they completely dominate the race, but Lowes also set a new lap record by over a second. Both riders came back from Japan brimming with confidence and hoping to bring any tips they may have picked up from the Suzuka-spec R1 to the WorldSBK paddock, plus they were further buoyed by a positive private test with the team at Almeria last week where they tried out a number of upgrades. It was Lowes' second consecutive victory at Suzuka and adds to the British rider's positive start to the 2017 WorldSBK season, which has seen him record two podiums in the last six races to currently sit fifth in the championship standings with 148 points. Lowes had a challenging weekend last time out at Laguna Seca for round 8 of the season but recovered to finish Race 2 in a solid ninth place. The 26-year-old is looking to make a step forward after the summer break and establish himself as a regular contender for the race win, plus having worked hard with the team during the recent Almeria test, is excited to get back on his R1 in Germany. Van der Mark is also raring to go after a positive conclusion to the recent test and his success at Suzuka, which was the third time he has stood on the top-step of the podium at the legendary endurance race. The 24-year-old Dutch rider has enjoyed an encouraging start to the 2017 season, having led Race 1 at Misano for 13 laps before a tyre failure and with three top four finishes to his name. After a double top-ten finish last time out at Laguna Seca he currently sits seventh in the championship standings, with 129 points after eight rounds, just 19-points behind his teammate Lowes. The Lausitzring is located 60km north of Dresden in the Lausitz region in Eastern Germany and the 4.255km track, which was built back in 2000, is known for its technical layout. It has 14 corners in total, six right and eight left-handed, and 2017 will be the last season WorldSBK visits the circuit before it will be closed to the public at the end of 2017. The Pata Yamaha Official WorldSBK Team hit the track at 9.45am on Friday morning local time for Free Practice 1, with qualifying starting at 10:30am on Saturday. Race 1 takes place at 13:00pm on Saturday with Race 2 at 13:00pm on Sunday. "After a few weeks away from the World Superbike Championship I am looking forward to the Lausitzring race! I am still buzzing from winning the Suzuka 8 Hours and after a really positive test in Almeria, I am excited to be getting back to the racing action. I am also delighted to have extended my contract for the 2018 season with the team and hopefully, we can finish this year as strongly as possible. My goals are for a solid weekend to give us something to build on for the rest of 2017 as we try to close the gap to the guys at the front. It's a bit of a peculiar track at Lausitzring, it is quite bumpy and also has quite a technical layout. The whole team have been working really hard and haven't really had a summer break, so a big thanks to them too and I cannot wait to get back on track!" "I simply cannot wait to get back on track at the Lausitzring! It has been a busy summer break for us, but winning at Suzuka with Yamaha was incredible, plus we had a very positive test in Almeria last week, so I am excited to get back into action in Germany. I am also happy that my teammate has extended his contract for next season, which means we have another year of racing together! The Lausitzring is a different type of circuit and it presents a unique challenge, so it will be interesting to see how the R1 performs at the track, and after all the hard work the team have put in over the summer break I am excited to get back on the bike. We tested some new updates in Almeria and we hope that they will allow us to take the fight to our rivals for the rest of the season!" World Superbike action will begin tomorrow morning for the first free practice session at 9:45 local time (GMT +2). A hectic opening day of action for the 2017 FIM Superbike World Championship at Lausitzring has drawn to a close with Stefan Bradl in 12th place – despite an unfortunate tumble during FP2 – while his team mate for the German Round Davide Giugliano was 18th in the combined times of today’s two free practice sessions. Both riders will therefore take part in tomorrow’s Superpole 1, with the goal of advancing to the second session and battling for a spot on the first four rows of the grid for race one. Free Practice 2 was red flagged with 35 minutes to go after Bradl crashed out on oil left by Alex Lowes’s bike at Turn 14 a few minutes earlier. The German rider got away with only a severely bruised and painful left elbow after x-rays showed no sign of fractures, but his condition will still be reviewed by the medical centre tomorrow morning before FP3. The considerable damage taken by his Fireblade during the crash, however, resulted in a considerable amount of extra work for Stefan’s crew, which was forced to put together a whole new bike. But the drama was not over: a rain shower began shortly after the red flags were deployed, which further extended the break to approximately one hour and thirty minutes. As the session restarted, wet conditions made it impossible for any rider to improve their lap-times before the chequered flag. 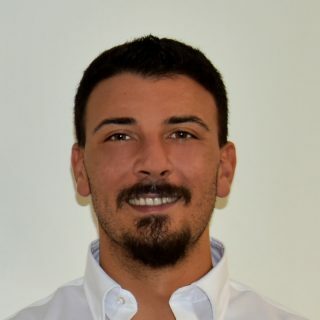 Davide Giugliano picked up from where he left off here at Lausitzring three weeks ago in a test to continue his familiarisation with the Honda CBR1000RR Fireblade SP2 machine. The 27-year-old from Rome tried different set-up options while assessing different ride heights, although his progression was affected by the aforementioned incidents of FP2. This robbed him of some much-needed dry track time. World Superbike will return to action tomorrow morning with the 25-minute free practice 3 session, which will get underway at 8:45 local time (GMT +2), which will be followed by Superpole 1 (10:30) and race one (13:00). It was an unlucky day for us. After the long break I jumped back on the bike and felt pretty comfortable, which was really good if we consider that this is almost a new track for me. FP1 went well because the pace was good and so was the feeling with the Fireblade. We were ready to make more improvement in FP2 and made some changes to the bike and went back out on track with used tyres, but very soon we switched to a fresh set because we could see that it was going to rain. I was on a fast lap and feeling good, but then crashed on the oil left by Lowes’s bike. The crash came without warning, as I saw neither yellow nor oil flags. It was a quite big tumble and I landed on my left elbow. It is severely bruised on the joint, meaning I don’t have the full movement. Fortunately there is no fracture, but we need to wait and see how the situation will evolve through the night. It’s a shame, because I was feeling strong and it’s my home round, so I very much hope I can ride tomorrow. It’s been a strange day today. This morning we had to double-check everything from the previous test and get back into riding mode, although the feeling was still not quite not there. The Fireblade is still a very new bike to me despite the test we had three weeks ago, so all we needed was track time. We had some ideas in mind for the afternoon session but the red flag and the rain spoiled our plans. I’m still positive, though. Free Practice 3 tomorrow morning is going to be very important for us: if we make the right changes, then we’ll be back on course. Stefan did well in FP1: after the long break and after so much time since his last race here, he picked up the pace quite quickly and improved in each outing. Things were looking quite good in the afternoon, but unfortunately he crashed out on some other rider’s oil left on track: he had just gone out on a fresh set of tyres after spending most of his time on used ones. That’s a shame, really, and I hope he will be able to ride tomorrow. Davide’s morning session wasn’t easy. We made some changes to the bike in the morning but he had a difficult time in picking up speed. We had a plan to turn it around in the afternoon, but obviously the red flag first and the rain later didn’t help. We’ll have to make the most of tomorrow’s FP3 session in order to find a better direction for Superpole and the race. 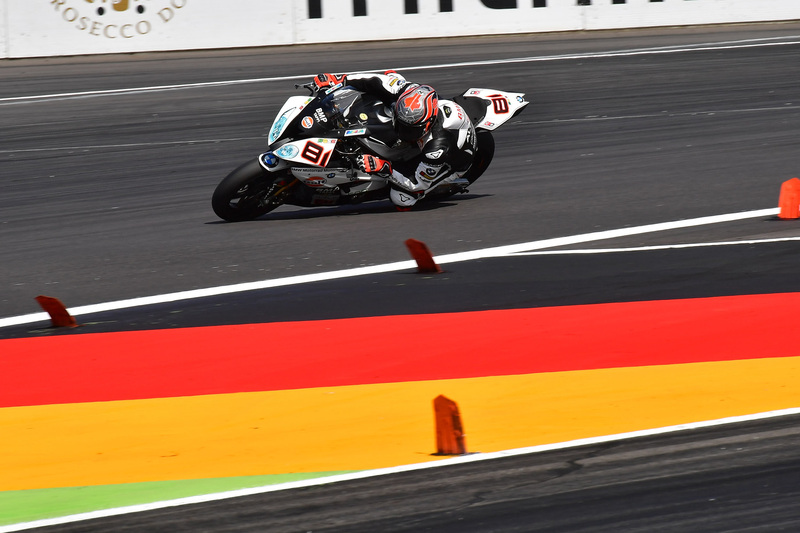 The Althea BMW Racing team is hard at work at the Lausitzring in Germany this weekend, where it has already completed the first timed practice sessions making up this tenth round of the Superbike World Championship. In dry conditions, Jordi Torres got off to a good start, despite losing a little time early on in the session, completing the opening practice eighth with a time of 1’38.462. Raffaele De Rosa, working to get to grips with the German track, which he is experiencing for the first time with the Superbike, closed in 18th position (1’39.691). The second session brought both heavy rain and a prolonged break mid-session after Lowes crashed, leaving oil on the track. The session restarted but on a wet track, meaning that Torres was unable to improve on his best time set in the morning, finishing ninth as a result. De Rosa, who lowered his time early on in the session, before the rain, closed in fifteenth place with a time of 1’39.387. The sixth round of the Stock1000 championship also got underway today. Marco Faccani worked hard in the first practice to close eighth with a fastest time of 1’40.750. Later in the day, in the first qualifying session, the Italian was able to lower his time by three tenths, to finish eleventh thanks to a best of 1’40.405. KRT riders Tom Sykes and Jonathan Rea finished first and second quickest respectively on their official Ninja ZX-10RRs after the FIM Superbike World Championship season got going again today at the Lausitzring, at the end of a five weekend-long summer break in competitive action. After an opening day of practice during which FP2 was red flagged and delayed in its completion for one and a half hours, Sykes led his team-mate in the combined timesheets by 0.332 seconds. 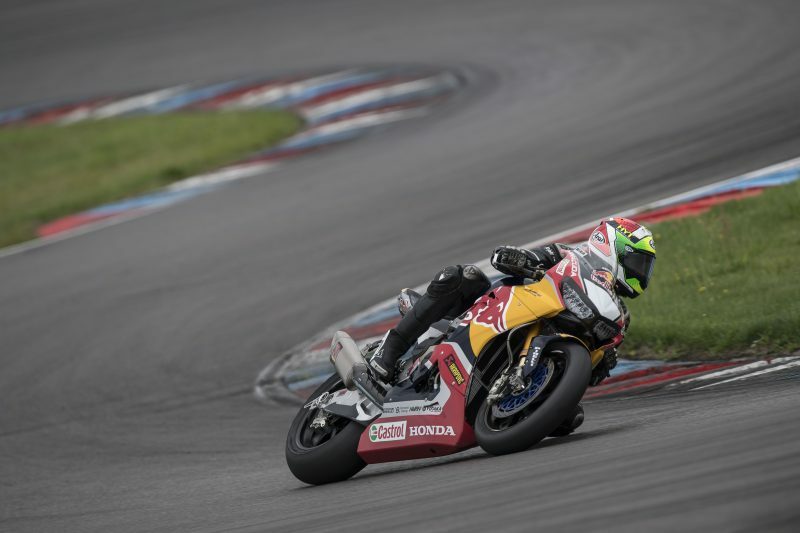 Both riders had tested at the Lausitzring during the summer break and felt that even in the dry part of today the track conditions were less favourable than they had been two weeks ago. Sykes had a small fall in the afternoon session today and went back to the pits unharmed but before he could even consider taking to the track again on a repaired machine a red flag was shown, due to an oil leak from a rival’s machine. Threatening rains soon arrived with a vengeance, which led to a long delay as the track was cleaned and dried in some sections. After the eventual FP2, restart in wet and patchy conditions, neither KRT rider opted to take to the track again but focused instead on working out their final settings for FP3, Superpole 2 and then race one on Saturday 19th August. As ever Superpole 2 will determine the final grid positions for the top ten riders from today, plus the two best qualifiers from Superpole 1 on Saturday. Race two at the Lausitzring will take place on Sunday. The Pata Yamaha Official WorldSBK Team put in a sterling effort at the Lausitzring on Friday for round 9 of the 2017 FIM Superbike World Championship, despite having to deal with thunderstorms and a red flag in FP2. Alex Lowes ended the day 10th quickest overall, the British rider making it straight through to SP2 despite a technical issue in FP2. Michael van der Mark was unlucky to end the day outside the top ten after he was caught out by the timing of the red flag and the subsequent wet weather. The Dutch rider finished the day just 0.071s behind his teammate in 11th, meaning he will have to fight his way through SP1 tomorrow. The team was forced to work hard to catch their competitors after missing the recent test at the Lausitzring due to the riders' Suzuka 8 Hours commitments. Despite this, Lowes managed to end the morning's FP1 session in 10th with a 1:38.470 after spending the session searching for a good setup on his R1. In FP2, the 26-year-old British rider was looking good to improve on this time after making some changes to his bike before a technical issue forced him to pull off track. The red flag was shown due to the track conditions, but luckily for Lowes that is when a heavy thunderstorm hit the circuit causing an hour delay in proceedings. Incredibly, as they waited for the track to dry, the team managed to change the engine in Lowes' R1 before the session resumed. This allowed Lowes to head back out in the wet, although the chance to improve his time from FP1 had gone and he ended the day in 10th overall. His teammate van der Mark also spent the morning's FP1 session searching for a good setup on his R1 and finished just behind Lowes in 11th with a 1:38.744. After making some changes to his bike for FP2 the 24-year-old struggled to find a good feeling on old tyres at the start of the session but once he had fitted new rubber to his R1 he immediately made a step and felt good on the bike. He was one of only four riders to improve their times in FP2 as he set a 1:38.541. Unfortunately, just as he was about to challenge for a Top 10 position, the red flag came out and with it the torrential rain. That ended any chance van der Mark would have to improve on his time, although it was still good enough to hold onto 11th overall on the timesheets. The Pata Yamaha Official WorldSBK Team are back in action on Saturday at 8:45am local time for FP3, with qualifying starting at 11:30am and Race 1 at 1pm. "It was nice to be back out on my Pata Yamaha R1! After missing the test here, we could have done with a bit more of a consistent day. In FP2 it was amazing that the guys managed to change the engine in such a short space of time, so I want to say a huge thank you to everyone in mine and Michael's team who helped out. We have a lot of work to do in terms of improving our level this weekend, so we will have a think tonight and see what we can do tomorrow. The podium fight looks difficult for us but we can definitely take a step forward." "This morning was a little bit difficult as we were trying to find a better setup for the bike and it proved tricky. This afternoon we changed quite a lot and at first, it didn't really work for me, but then we put some new tyres in and I made quite a step. Unfortunately, that was when the red flag came out and then the rain came! At that point I was 11th, which is a shame as I had the pace to get through to SP2. I think we could have improved the bike a lot more if it stayed dry but we have to live with it. One positive point was that when the session re-started it was wet and I had a great feeling with the bike, so it felt good to do some laps in those conditions as you never know what will happen on race day. We have to improve some more things on the bike, but I think we are going in the right direction." "While Alex and Michael were in Japan testing, racing, and more importantly winning the Suzuka 8 Hours, our competitors were here at the Lausitzring doing a two-day test. Therefore, we fully expected to be further away from them than we would like on day one, simply based on the fact we haven't had the luxury of that additional track time and setup work. That said, the gap to the front riders is not too bad. It would have been nice to have two full dry sessions to improve further but I think that we can improve in positions compared to where we are now. Lausitzring is probably not a favourable circuit for the character of the R1, so we will look to maximise what we can achieve here over the next two days and really look forward to moving on to happier hunting grounds at Portimao." Making progress through race weekend, despite encountering some changeable track conditions, Rea built up to an eventual second place in the opening race, having scored second spot in Superpole. He chased eventual winner Chaz Davies all the way to the flag after he took second place on lap three, but could not find enough traction near the end to mount a final challenge for victory. Rea was less than two seconds down on the win at the flag. Sykes, who had set a new pole record for the Lausitzring earlier in the day as he captured his 42nd career Superpole win, led the first lap of race one. After first Davies and then Jonathan passed him, Tom could not regain a winning position and he finished 3.25 seconds from first place. His pole win was the 70th for Kawasaki in WorldSBK history and was taken on Tom’s 32nd birthday. After more heavy overnight rain, the track took some time to get back to the grip level of the early sessions today, but when it did it allowed the leading three to move well ahead of the chasing riders at the flag, with Sykes 13 seconds up on the fourth placed rider. In the championship standings, with one more Lausitzring race to go tomorrow, Sunday 20th, Rea now has 361 points and Sykes 298 – with the official Ninja ZX-10RR duo still 1-2 in the rankings. Davies’s win takes him to a total of 251 points, in third place. Race 1 at the Lausitzring, a home track for German manufacturer BMW of course, proved to be a mixed bag for the Althea BMW Racing team. Jordi Torres was able to make a great recovery having lost ground at the start, crossing the line ninth, while Raffaele De Rosa suffered a crash mid-race. Over in Stock1000, Marco Faccani has qualified eighth for tomorrow’s14-lap race. Superpole 1: De Rosa completed a first fast lap, in 1’38.758, which positioned him second mid-session; after a tyre change, the Italian was back out, able to improve on his time by a further six tenths. Finishing with a fastest lap of 1’38.194, the Althea BMW rider closed the session third, which translated into 13th on today’s race grid. Superpole 2: The 1’37.369 set by Torres early on saw him lying seventh prior to the tyre change. In the final stages, on a qualifying tyre, the Spaniard was able to drop his time by a good six tenths, (1’36.739), to qualify in a solid fifth place. SBK – Race 1: From fifth on the grid, Torres risked crashing through the first corners when the rear of his BMW started to slide around. Forced to modify his trajectory and losing many places as a result, Jordi found himself down in 20th position. With a lot of work ahead of him, the Spaniard immediately started to play catch-up, putting together a series of fantastic passes to climb to 14th by lap six. Over the next laps, his solid pace allowed him to improve further, passing one rider after another to cross the line ninth today. De Rosa earned a couple of positions off the line, eleventh after one lap. Finding good pace through the first phase of the race, the Italian battled in a group with Laverty and Forés. Unfortunately, on lap 11, Raffaele suffered a crash and although he attempted to continue the race, he was forced to retire a few laps later. Superstock 1000 - qualifying: eighth in this morning’s final practice, Faccani recorded a series of interesting times in the qualifying session, the best of which, a 1’39.330, awarded him eighth position on tomorrow’s Stock1000 race grid. It was a mixed Saturday for the Pata Yamaha Official WorldSBK Team at the Lausitzring for round nine of the 2017 FIM Superbike World Championship as Alex Lowes pulled off an excellent ride to secure sixth, whilst his teammate Michael van der Mark suffered a loss of rear tyre pressure that saw him cross the line in 15th. Lowes rode superbly to finish less than 0.8s off the man in fourth, despite struggling a little on a full fuel load at the start of the race. His teammate van der Mark had a great start during the race, but the rear tyre pressure loss - the reason for which is yet unknown - forced him to drop his pace significantly and he bravely bought his R1 home in 15thplace. Lowes made it directly through to SP2 on Saturday and the 26-year-old was on blistering form, managing to set a 1:36.7745, just 0.653s from pole, to start Race 1 from the head of the third row in seventh. When the lights went out for Race 1, Lowes made a superb start, cutting inside at Turn 1 to move into fifth and breaking away from the rest of the pack with the leading group of five. Unfortunately, he didn't quite have the front-end confidence he needed on his Pata Yamaha R1 with a full load of fuel and so could not take the fight to the leaders in the opening laps, but instead became involved in an excellent race-long battle with Leon Camier. On lap 4 Camier passed Lowes for fifth, but as the race went on the feeling with his R1 improved dramatically as the fuel load dropped, allowing him to fight back and start to chase down Camier and Marco Melandri ahead of him. Lowes pushed hard in the final laps and closed down the gap to the men in front dramatically but, unfortunately, he ran out of laps, crossing the line in sixth just 0.1s behind the fifth-placed Camier and less than 0.8s behind Melandri in fourth. Due to the new grid rules for 2017, Lowes will line up on the front row for Sunday's Race 2 in third and is confident the lessons learnt from today will allow him to make a step forward as he aims to secure his third podium of 2017. His teammate van der Mark had to go through SP1 for only the third time in 2017 after he was unlucky with the timing of a red flag and the subsequent thunderstorm on Friday that saw him finish FP2 in 11th overall. The 24-year-old Dutch rider made a statement in SP1 as he went over 0.5s quicker than the rest of the field on a race tyre to finish the session in first and head into SP2 with his teammate Lowes. He went onto qualify in the middle of the fourth row in 11th and then made a blistering start when Race 1 got underway, blasting his way past a number of riders to be up to eighth by the end of the first lap. While pushing to join the battle at the battle at the front, he ran off track on the second lap and had to rejoin in 16th. Undeterred, the former World Supersport Champion started to battle his way through the field, making it up to 11th before he started to lose pressure in his rear tyre. 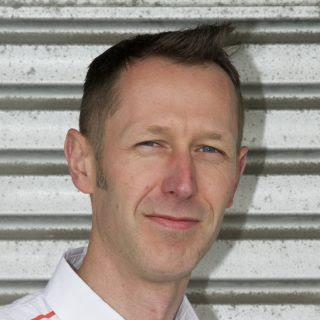 As the tyre visually deflated, van der Mark bravely carried on, despite advice to return to the pits and retire from the Pata Yamaha team, who were worried for his safety. Incredibly, he managed to bring his R1 home in 15th to salvage a championship point, despite the fact that by the time he reached parc fermé his tyre was completely flat. Van der Mark will, therefore, line up on the grid for Sunday's Race 2 at the back of the fourth row in 12th, eager to make amends for today's bad luck. "Today has been pretty good, I am quite happy with my race considering missing the test and yesterday's dramas! I had a really good race with Leon Camier but, unfortunately, I didn't quite have the front-end confidence to pass him. Fair play to him, he didn't make one mistake and did a good job. I learnt quite a lot during the race today, my pace was honestly better than I expected and I think we can make some good steps for tomorrow. I am looking forward to Race 2, the R1 is working a lot better than last year at this track and I feel that I rode well today. I want to say thank you to my team who have done a great job this weekend, let's see if we can take another step forward tomorrow!" "To be honest I was happy with the way I made it out of SP1 into SP2. I went more than a second faster on my race tyre in SP1 than I had done so far, but in SP2 on the qualifying tyre, I didn't have a great feeling. I think the rear was pushing the front, so I had to start from 11th on the grid. During the race, I had a good start but I started to struggle with the grip right from the early stages. I then made a mistake, although I am not sure what really happened, I ran off track and then had to fight my way through the field. To be honest, while my pace was not fantastic, it was better than in practice. I just focused on maintaining this pace, but then I started to get slower and slower and the bike was moving around a lot. I just finished the race as every point is vital in this championship, but when I got back to parc fermé I realised I had a completely flat tyre. We obviously have to find out how this happened, which we will work on tonight, and I will give my best again in Race 2 tomorrow." "It has been a complicated weekend so far here at Lausitzring: thunder, lightning, tropical rainstorms, and some challenging issues also for the team to overcome but I think we have to be - on Alex's side of the garage anyway - happy with today's performance. Having not tested here we knew that trying to take the challenge to the top four was going to be difficult but Alex rode a very considered and intelligent race to look after his tyre, be fast but consistent, and in the end that meant missing out on fourth position by only seven-tenths of a second. Good job by him and his team and with this race experience under their belts and a couple more improvements for tomorrow, we look forward to starting from the front row and seeing what we can achieve. Michael did an excellent job in SP1 to do a 1:37.5 lap and dominate the session to make it through to SP2 earlier today. He also made a great start to the race from 11th on the grid, challenging immediately inside the top eight and had a good consistent pace going until, unfortunately, he began to lose pressure from the rear tyre before mid-race. The problem was clear watching from trackside so we became very concerned on the safety aspect and gave him the signal to enter the pits and retire, but typically enough, Michael managed the situation and even though there was only one point to be scored, he made sure he stayed out and achieved that. We are not sure of the cause of the pressure loss, but of course, it is critical that we find that information out as quickly as possible." 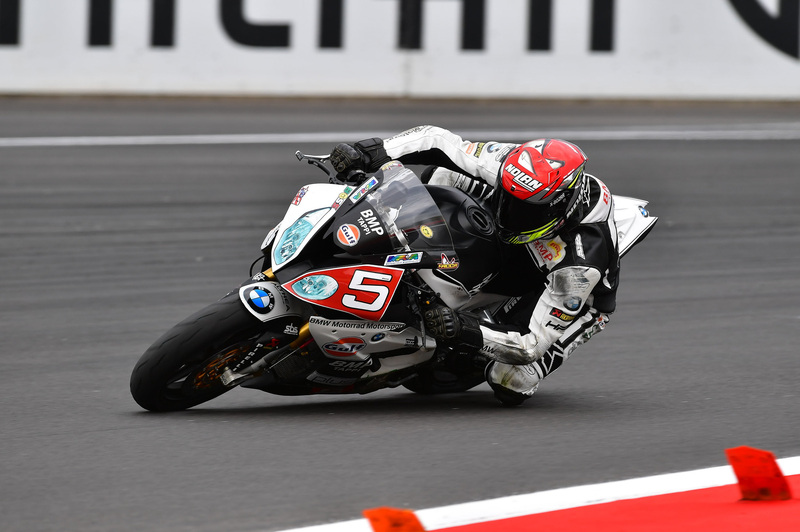 Althea BMW Racing Team has concluded round nine of the SBK World Championship at the Lausitzring in Germany but results unfortunately failed to meet with expectation. Jordi Torres crossed the line eighth in today's second Superbike race, Raffaele De Rosa fifteenth, while Marco Faccani closed the Stock1000 race in twelfth position. Superbike - Race 2 – sixth on the grid thanks to his eighth place finish in race one yesterday, Torres lost a little ground off the line today, tenth through the opening stages. Ninth on lap nine, the Spaniard continued to push to close the gap, earning another position in the latter stages to eventually cross the line eighth. Like yesterday, De Rosa immediately made up a couple of places, lapping twelfth through the first laps. Thirteenth by mid-race, a constant pace saw the Italian hold that position for the best part of the race, before crossing the line fifteenth. 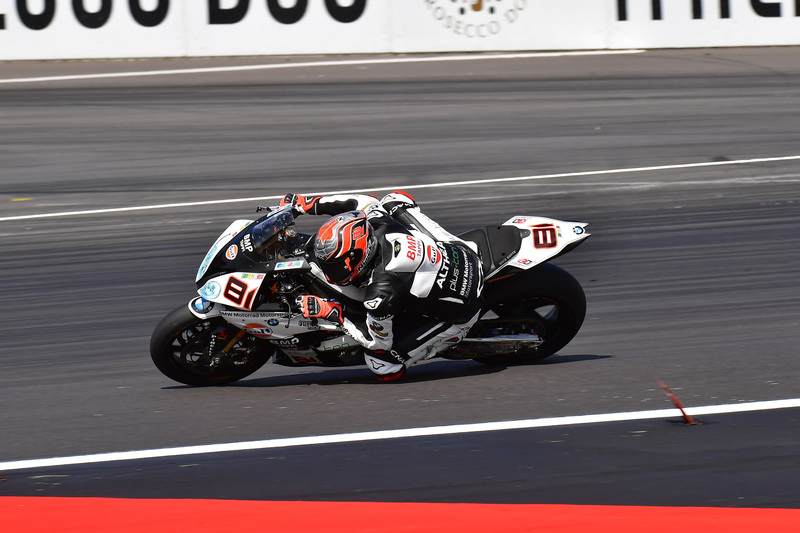 STK1000 - Race – eighth on the grid, Faccani was ninth through the first laps. Moving into eighth on lap five, Marco unfortunately came into contact with another rider on lap seven, losing several positions and dropping back to 16th. Working hard to catch up, the Althea BMW rider passed a number of riders through the final stages to finish the race in twelfth place. After nine rounds of the championship, Torres lies ninth in the standings with 109 points while De Rosa has 31 points, to position 18th. In the Stock1000 category, after six rounds, Faccani is fifth with 56 points. The second WorldSBK race of the Lausitzring weekend saw Jonathan Rea (KRT) take the runner-up spot and his team-mate Tom Sykes score a fourth place finish, meaning that the official Kawasaki riders remain 1-2 in the championship standings with four rounds to go. 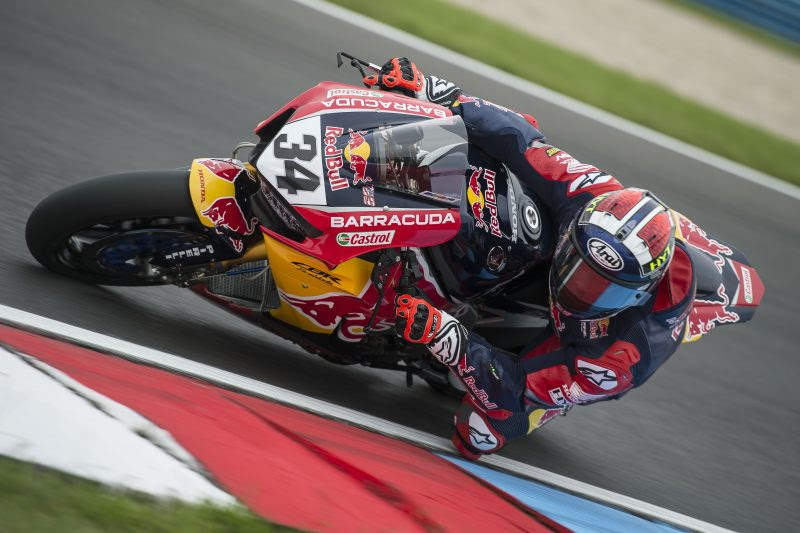 The Lausitzring weekend ended the summer break in the FIM Superbike World Championship class. In scoring two second places and 40 points in the comeback weekend Rea extended his lead over his own team-mate Sykes to 70 points. Sykes’ opening day podium at Lausitz, and second day fourth place, gave him 29 points in total this weekend. Sunday’s race in Germany saw Sykes start from seventh place on the grid and Rea eighth, under the new rules which put the podium finishers from the first race onto the third row for race two. As on day one, Chaz Davies won the race, this time by 2.290 seconds. A good start from today Rea saw him move up to third place on lap one, then take the lead on lap five, being passed by Davies on lap 11. Sykes made a good launch from his third row grid slot but touched the bike of another rider in turn one, losing momentum. Unable to pass other riders easily in the early laps he worked his way to fourth and finished clear of a battling group of riders behind him. After nine rounds and 18 individual races Rea has 381 points, Sykes 311 and Davies 276. Kawasaki leads the Manufacturers’ Standings by 56 points. Returning WorldSBK venue Portimao, in Portugal, will host the tenth round of the championship, one month from now. 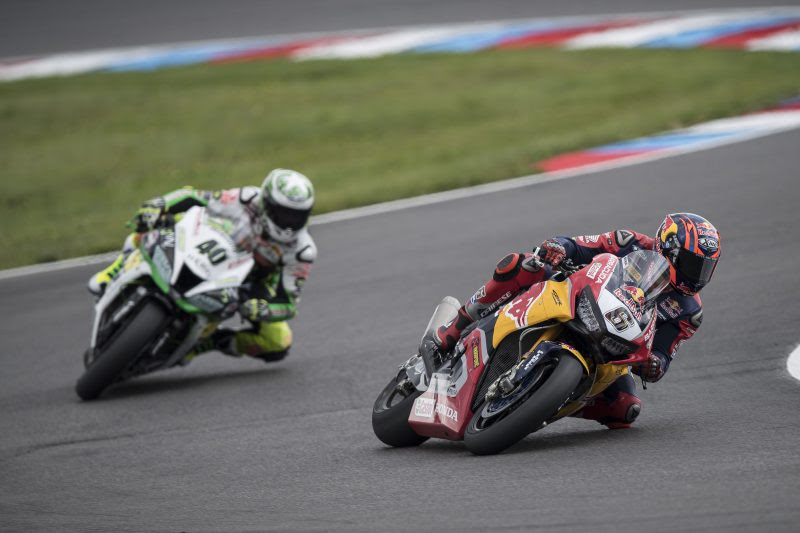 The German Round of the 2017 FIM Superbike World Championship has taken place with local hero Stefan Bradl in thirteenth place at the end of the 21-lap encounter at the Lausitzring racetrack. 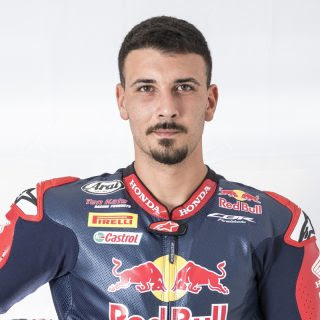 His Red Bull Honda World Superbike team mate for this ninth event of the season, Davide Giugliano, crossed the finish line in 17th position. 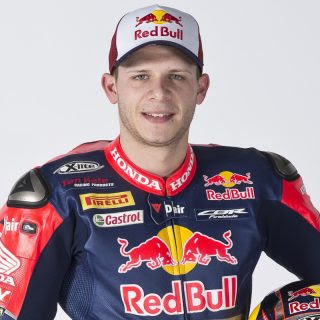 After missing the opening race of the weekend due to severe pain in his elbow, which was badly bruised and wounded following an unfortunate crash on Friday, Bradl was able to line up on the grid for race two. The 27-year-old from Augsburg maintained his position at the start and as the race got closer to its halfway point, he entered a battle for 12th place with Leandro Mercado and Raffaele de Rosa. Bradl successfully overtook the latter on lap 19 as he moved up to thirteenth, a position he defended hard up to the chequered flag. Davide Giugliano did not enjoy a good start as he was down to 20th place on the opening lap. The Italian was able to make his way back to 17th place in the early stages but struggled to keep a competitive pace as the laps went by. In the final part of the encounter, the former STK1000 Champion fended off the attacks coming from Badovini to end the race two positions away from the top 15. World Superbike will now enjoy another break before the next round of the season, which takes place at Portimão’s Autodromo do Algarve on September 15-17. It was good to take part in the race. I felt OK to ride because when the adrenaline kicks in you don’t feel too much pain. I feel it was the right decision to sit out yesterday’s race in order to be almost fully fit today. Unfortunately, my feeling with the bike today was not perfect, because it was nervous over the many bumps and I suffered a bit on corner exit as well. Surely the lack of track time from not having raced yesterday did not help. I had to keep my pace under control for the most part, but in the final laps I could push a bit more and overtake De Rosa before the finish line. I’m a bit disappointed with this race and obviously for the weekend in general, but I hope for next event we’ll be able to make a bigger step forwards. This morning we made a good step forward in warm up and I was able to lap much faster than I had done over the whole weekend. I felt good with the bike at the beginning of the race and was able to make some passes, but unfortunately after 4 to 5 laps the rear tyre started to wear, so it was impossible for me to keep up that good pace. There isn’t much else to say, really, but I guess this is part of racing. Too bad, because we worked very well this morning and my feeling with the Fireblade had improved significantly from yesterday. We tried some changes this morning with both riders and they turned out to be quite positive. Stefan’s elbow condition improved from yesterday so he could take part in the race, and he had quite a good start and fought for half the race for 12th place. Unfortunately, the bike was moving a bit too much and he was having a tough time, and he was also struggling with drive out of the corners. Davide had an encouraging first part of the race, but from lap three onwards he started to struggle with rear grip, and data confirmed this issue. We have another break now, which will help us analyse all the telemetry ahead of Portimão. It’ll be interesting to go back to Portugal after the tests we did earlier this year, and the extra day of testing after the round will surely be of great help for us, too. Pata Yamaha Official WorldSBK Team's Alex Lowes produced another blistering display to charge through the field and secure a fifth-place finish in Race 2 at the Lausitzring for round nine of the 2017 FIM Superbike World Championship. His teammate Michael van der Mark struggled early on during the race with the feeling on his R1 but recovered well to cross the line in 11th. After his sixth-place finish in Race 1, Lowes lined up on the front row for Sunday's Race 2 in third but endured a tricky start that saw him drop down to 8th by the first corner. The 26-year-old British rider didn't panic and showed excellent maturity during the early laps of the race, as he worked on improving his understanding of his Pata Yamaha R1 at this tricky circuit. He then settled into an excellent rhythm and started charging his way through the pack, enjoying an excellent battle with Eugene Laverty before the Irish rider crashed out of the race on lap 9. By lap 16, Lowes had fought his way up to sixth and caught the group of riders battling for fourth place. Despite drops of rain appearing in sector 4 during the last few laps, Lowes carried on pushing as hard as he could and closed the gap to Leon Camier in fifth. Lowes kept on pushing and in the last corner, in a dramatic finish, he made an excellent move on Camier to secure fifth and collect 11 championship points. His teammate van der Mark started from 12th on the grid but the 24-year-old Dutch rider did not have the best of starts and found himself in 14th place after the first few corners. Struggling to turn his R1 while on the throttle meant that it was hard for van der Mark to pass the riders ahead of him and he lost precious time, but undeterred, he remained focused and step by step started to make progress. On lap 11 he had made his way up to 11th, but by this time there was a large gap to the rider in tenth and he faced a tough task to close him down. Digging deep, van der Mark managed to up his pace in the latter stages of the race while his competitors were slowing down. He put in a gargantuan effort to close down Xavi Forés in tenth, his pace half a second quicker than the riders in front of him during the last few laps, but try as he might it was a bridge too far and he crossed the line for a hard-fought 11th place, collecting 5 championship points in the process. "I am disappointed with the start of the race, I wanted to improve on my start from yesterday and make best use of the front row position but it didn't work out! My pace was a bit better early on than Race 1, but in general it was a good race for me, I had fun on the R1 despite this track being so strange, and I really enjoyed the battles. I am happy to have secured a sixth and a fifth-place finish this weekend, but we can definitely improve on these results so I will work with the guys and see if we can make a good step forward for Portimao. Honestly, I really enjoyed how we worked this weekend, I think the guys have done a great job and I am really looking forward to Portugal!" "It was a difficult race for me. In the beginning, I struggled to pass some riders and I lost quite a bit of time. I struggled with turning the bike while I was on the throttle and it was difficult to find a way to ride around this problem. To be honest, my race was quite consistent but I was not fast enough. I need to find a way to get the bike turning again because usually, this is one of the strong points of the bike. We have to work really hard and hopefully, in Portimao we can have some better results, as this weekend was not the outcome we are aiming for." "Today's race was also a little bit complicated for the team, as the whole weekend has been, but in the end, we saw another extremely solid ride from Alex. He kept calm after a difficult start and judged his pace superbly to retake many of those positions and to pass Camier on the final lap for a well-deserved top five finish. It is clear that the lack of testing here and the character of the track was never going to make it an easy weekend for us, so the team is happy with Alex's results and I think they will give him the confidence to take the next step forward and push hard for podiums as we enter the final part of the 2017 season. Michael also, unfortunately, had a really difficult start from the fourth row which made the race very challenging but the pleasing point - which I am sure he will reflect on despite his disappointment with the result - was that his pace improved quite significantly compared to yesterday. This was highlighted by the fact that Michael almost matched his best time on his final lap of the race, showing that he was learning how to get the best out of the Pata Yamaha R1 on this track. His potential and that of the bike is more, and I know that Portimao will suit us better."